There are many situations in one’s life where an individual possessing properties, bank accounts, etc. may not be in a position to perform his duties due to reasons like being abroad, ill, old etc. In such situations if the transaction requires the presence of the individual who is not able to be present personally, then the only way out is to give the powers to act on behalf of the individual to another person. This is when a Power of Attorney deed is to be created. It is very common these days to give the powers to a trustworthy person to conduct the registrations, or sale or rent out etc if you are busy with your other schedules. A Power of Attorney is a legal document by which one person gives the right to perform or powers of transacting in matters relating to property, banking, legal and judicial proceedings, tax payments, etc, to another person due to certain reasons like being out of country, or getting old, or not able to look after one’s duties in those matters etc. A power of Attorney is an authority given by a written formal instrument whereby one person termed the donor or principal authorises another person termed the donee, attorney or agent to act on his behalf. Usually Power of Attorney is created by anyone who cannot do the transactions in person by himself or herself due to various reasons. The following are the reasons that commonly force an individual to give the power of performing to another person. A person can give to another person a complete general right or power to act lawfully with respect to his property or bank accounts or tax payments, or registration work or to sue a third party etc. It is commonly termed as GPA. Either you can give a GPA for all your properties, banking transactions, tax matters, registration, legal disputes and court matters etc. Or you can give a general power to any one category like only for all property matters or only for all Banking processes etc. This type of Power is very wide and has lot of risk if the Attorney is not a trustworthy person. To learn more visit our General Power of Attorney Section. The other type of Power granted is the Special power which means it is granted for only a specific task or work. A Special power of Attorney is to be made by a person when any particular or specific task or act is to be done. Once the particular act is completed the Special power of Attorney comes to an end. This is generally used when you want to rent out your property or appear for the registration of any property or appear in a court on behalf of the Principal or to appear before the Tax authorities etc. To learn more visit our Special Power of Attorney section. A General power of Attorney is very much different from a Special power of Attorney. The GPA always confers a general power of performing while the Special power of Attorney confers only a specific power to perform any particular act or task. The GPA covers a wide range of powers and is not restricted to any particular work. Hence, it needs to be given only to a very trustworthy person. The Special power on the other hand comes to an end once the task or specific act is done and is always work specific. A person can authorise the Attorney to sell, buy, rent out, recover his debts, open bank accounts, close accounts, attend the courts, appear on behalf of the principal in legal matters or file tax returns etc under the General powers. It is not restrictive. But in Special Power of Attorney, only one act among the above mentioned acts is to be performed. You cannot create a Special power of Attorney for many acts. In that case you have to create separate Special Power of Attorney deeds for each act. Usually a Power of Attorney comes to an end with the death of the Principal. But if the Principal wants the Power of Attorney deed to continue even after his death then he has to mention it in the Power of Attorney deed. Such a Power of Attorney is termed as Durable Power of Attorney. If there is no mention that the power shall continue after the death of the Principal then it is a non-durable Power of Attorney deed. Hence if the power has to continue even after the death of the Principal, then sure it should be mentioned in the deed. Otherwise, all power of Attorney deeds are considered as non-durable and ceases to exist with the death of the Principal. The name, age, address and occupation of the person who makes the Power of Attorney, the Principal. The person to whom the power is granted, the Attorney. The reason for granting the power of Attorney which should be legally valid. The date and place of making the Power of Attorney deed and the date from which it comes into force. The date of termination of the power of Attorney if it is limited by time. If no time is specified mention whether the Power of Attorney is durable or non-durable. If it is a general power granted then all the acts and areas of granting the power should be mentioned clearly. Whether any particular act is not to be done by the Attorney in certain areas should be specified. For. Eg. If general power for property is granted, the Principal can grant the power to buy or rent any property but may not grant the power to sell any of his property. In Special power of Attorney the specific or particular act or task that needs to be done and completed by the Attorney is to be clearly mentioned. Also the time limit within which that act is to be done is also to be specified. An NRI or non-resident Indian can make a Power of Attorney deed even by staying outside India without having to come to India for that purpose. Most NRIs have properties and banking transactions in India which may require their presence while transactions happen. But it is often not possible to come to India for each such transactions. For this then NRIs can always give the powers to transact to another person who is either a family member or a friend. Draft the Power of Attorney for NRIs, print on a plain paper and sign it. Go to the Indian Embassy or Consulate in that country and get it stamped and sealed from the embassy. 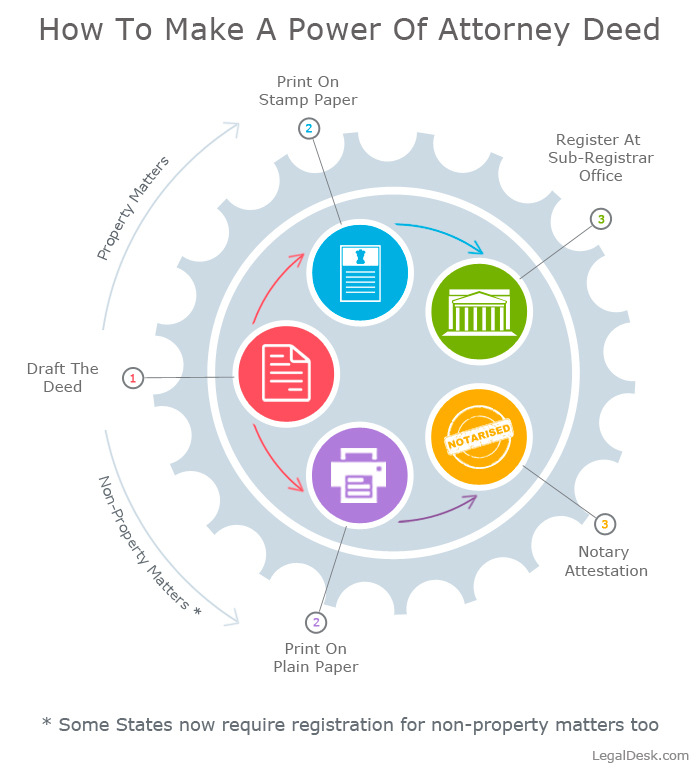 Alternatively, you can get it notarized by a Public Notary in that country mentioning the notary registration number on the seal on each page of the document. Send the attested deed by registered post to your Indian address in the name of any relative or friend. The person in India should get it registered in India at a Sub-Registrar office or Sub-Divisional Magistrate office by paying the appropriate registration charges applicable in that state. So simple! 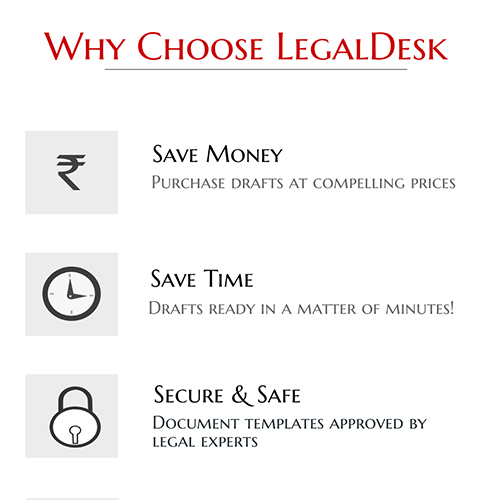 No hassles of finding a lawyer, no time waste, no tensions of finding the right clauses to include in the document and everything done so fast within a few minutes. That is the best part about making an online document.